Our June 2017 survey (the second in a monthly series) confirms a great deal of pessimism about American democracy. Democracy experts see American political behavior in 2017 as firmly outside the norm for consolidated democracies, although they remain divided on whether this threatens democratic stability. On average, experts rate a 10% chance of democratic breakdown in the U.S. within the next four years. 89% of respondents believe that democratic quality has declined over the last 10 years. 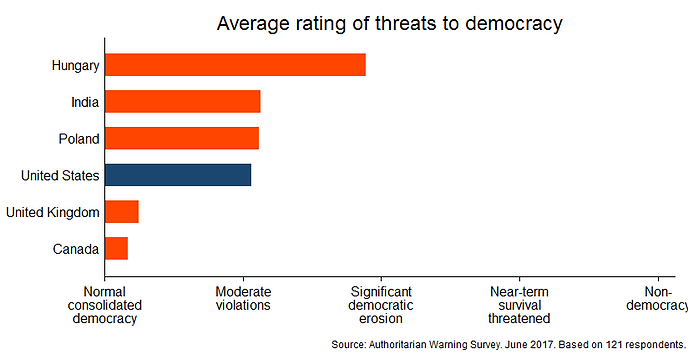 We polled 57 democracy experts on threats to American democracy. See herefor a longer description of the survey methodology and sample, including our attempts to limit ideological bias. For the first time, we also asked the same questions about five other countries: the United Kingdom, Canada, India, Poland, and Hungary. Separate experts were chosen for each country, with a total of 64 respondents. All are experts on their respective country and democracy, with a rough balance of experts based in the country and living abroad. This provides a useful set of comparisons for the U.S. survey. We first asked about six categories that have comprised key warning signs of democratic decline elsewhere: (1) Treatment of the media, (2) Constraints on the executive against abuses of power, (3) Elections and treatment of the opposition, (4) Civil liberties, (5) Civil violence, and (6) Rhetoric indicating democratic erosion or weak normative attachment to democracy. We asked about political leaders’ behavior in these categories, but did not single out specific leaders. 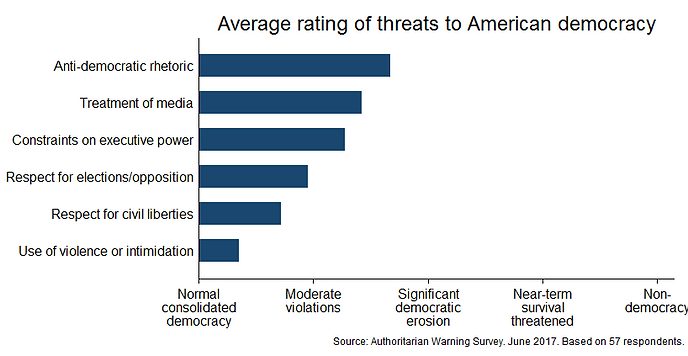 Respondents graded each category from 1 to 5, with higher values indicating greater threat to democracy. To ease interpretation, the values were chosen to have fairly concrete and tangible meanings: 1 = Normal consolidated democracy, 2 = Moderate violations atypical of consolidated democracy, 3 = Significant erosion of democratic quality with potential for future breakdown, 4 = Near-term survival threatened, and 5 = Non-democracy. Intentionally, coding a 3 or above on any dimension is a high bar. We also asked respondents about the likelihood of democratic breakdown, whether democratic quality and stability has improved or declined over the last 10 years, and what recent events or actions (if any) they consider most threatening to democracy. When asked to identify the most threatening recent event (if any), the most common response remained FBI Director James Comey’s firing (mentioned by about 28% of respondents). Other frequent responses were attacks on the media and the lack of congressional oversight. Fewer respondents pointed to elections (although some mentioned voter suppression efforts and Russian interference), civil liberties, or uses of civil violence or intimidation. The second figure shows the percentage who rated each category 2 or above (indicating behavior atypical of a consolidated democracy) and 3 or above (indicating erosion and future breakdown threat). Worryingly, majorities rate the U.S. as outside of the norm for stable democracies on every dimension but civil violence. Nearly all rate rhetoric, executive constraints, and treatment of media as outside the norm. However, only rhetoric has a majority rating a 3 or above. Indeed, respondents were cautious about assigning high values—not a single response out of 342 registered the highest threat category of 5. This reassures us that respondents are not amplifying their answers for effect. We also asked respondents whether democratic stability and quality has improved or declined over the last 10 years (chosen so the reference point is another Republican president). 89.3% responded that American democracy has declined, with 25% saying it’s “much worse.” Only one response said it has improved. Finally, we directly asked respondents about the likelihood of democratic breakdown (by their definition) within the next four years. Note that “breakdown” does not imply full dictatorship, only a sufficient erosion of democratic functioning. The responses averaged an alarming 10.0%, with a median of 9%. Responses ranged from a low of 0 (given by six respondents) to a high of 45%, although only six answered higher than 20%. Note that 10% is orders of magnitude higher than what traditional models of democratic breakdown would predict for the U.S. given its stability and socioeconomic advantages. Shifts from May to June: Results were highly consistent from our May to June surveys (which used distinct samples). The biggest shift was an increased threat rating for treatment of the media: the percentage indicating behavior outside the democratic norm rose from 89.7% to 98.2%, while the percentage rating behavior as indicating significant democratic erosion rose from 32.4% to 42.1%. The threat rating for civil violence also shifted up slightly, possibly in reaction to the attack on Steve Scalise and others on June 14. Threat ratings shifted down marginally for rhetoric, elections, and executive constraints. 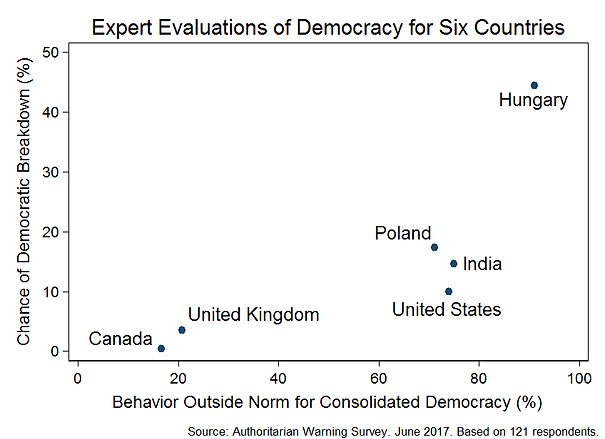 For each country, the above figure shows the percentage of all responses in which experts rate the country as outside the norm for consolidated democracies (horizontal axis), as well as the average predicted chance of democratic breakdown within four years (vertical axis). Again, the U.S. fits alongside Poland and India, although with a lower chance of breakdown. The results give us ample reason to be concerned about the future of American democracy. 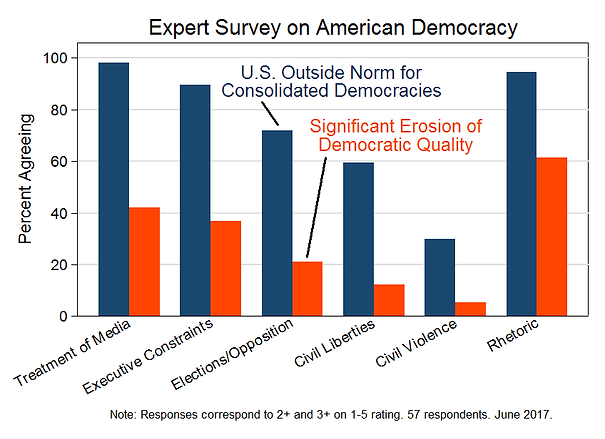 There is a near-consensus that American democracy has weakened over the last 10 years and is now outside the norm for consolidated democracies, especially in rhetoric, media freedom, and executive constraints. As discussed earlier, one should not view rhetoric being the highest-threat category positively since rhetoric can erode the norms holding democratic compacts together and often predicts later anti-democratic behavior. Comparing the U.S. to other countries provides useful context. American democracy rates as considerably worse than democracy in Canada and the United Kingdom and comparable to Poland and India. This is highly consistent with seeing American democracy as shifting downward in quality, but not yet threatened with near-term breakdown. Nevertheless, the estimated 10% chance of democratic breakdown (within four years) is a major warning sign. Even if one thinks this is an over-estimate by a factor of 10, it still implies a non-negligible chance of disaster. However, the most likely downward path for American democracy remains the steady erosion of democratic norms and practices, an uncertain road followed before by Venezuela, Hungary, Turkey, and many others. Michael K. Miller is an Associate Professor of Political Science at George Washington University.